Successfully Added iNew L4 Android Smartphone - 5.5 Inch Screen, Android 5.1, Quad Core CPU, 5000mAh Battery, Power Bank, 13MP Camera (White) to your Shopping Cart. iNew have launched some popular phones but the L4, their latest offering, looks to be the best yet. Coming with a 64Bit Quad Core CPU, 2GB of RAM and 5.5 inch 720p screen makes it a solid option for any gamer or heavy phone user and with a massive 5000mAh battery you can enjoy a staggering amount of usage time from each and every charge. The artistic styling’s of the iNew L4 Smartphone see a beautiful compliment of curved glass and a metal frame that seamlessly blend together making a great looking device. With a leather inspired rear cover and modest price tag this lush phone is easy on the eye and on the wallet. 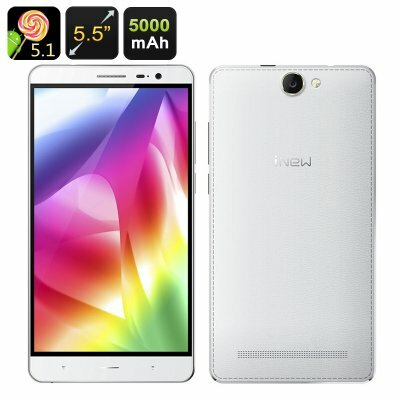 The 5.5 inch iNew L4 Smartphone won’t disappoint, as with 2GB of RAM and the 1.3GHz processor it is capable of running most apps and games while also being energy efficient in its power consumption. The borderless designed screen allows for a narrower frame for improved comfort and a better user experience while still encompassing a large viewing area. A truly humongous 5000mAh battery is crammed into this phone bring the iNew L4 phone 25 hours of talk time or 480 hours in standby. You can use the phone to charge up other electronic devices as it has power bank capabilities. With all this extra capacity the L4 Smartphone still manages to be just 9.5mm thick and 178 grams so it remains light and thin. With 4G connectivity streaming movies direct to the phone or uploading data to the web is smooth and fast without any lag, so you can enjoy the best cellular data speeds around. Running Android 5.1 offers a clean enjoyable user interface that is enhanced by the smart gesturing and wake features so navigating the phones systems and opening our favorite apps is quicker than ever before. If you’re looking for a mid range phone that can be used intensely throughout the day without running out of charge and comes with the latest features and styling’s then the L4 is one of the best choice around. This iNew L4 Smartphone comes with a 12 months warranty, brought to you by the leader in electronic devices as well as wholesale Android phones..